The New God Argument is a Mormon transhumanist argument for faith in God, or trust in posthumans that may qualify as God in Mormon theology. The argument combines religious titles with secular content to emphasize parallels that are essential to its conclusion. The argument does not prove God exists. Rather, it proves that if we trust in our own posthuman potential then we should trust that posthumans more benevolent than us created our world. Because such posthumans may qualify as God in Mormon theology, the argument suggests that faith in human potential should lead to faith in a particular kind of God. The Faith Position assumes that we will not go extinct before becoming posthumans. The New God Argument begins with the Faith Position, which is trust that we will not go extinct before becoming posthumans. We'll assume that our human civilization will evolve, technologically and otherwise, into attributes and abilities that differ as much from ours as ours differ from those of prehuman species. The assumption does not require a narrow understanding of what we must be or do as posthumans, or how long change may take. The only constraints are feasibility and assumptions we'll identify later. Implicit in the Faith Position is a transhumanist perspective that humans can and should evolve into posthumans. Rather than devaluing humans, this assumption embraces a radical humanism: that human dignity arises in part from human overcoming. In other words, part of what it means to be human is to extend ourselves, as we've done for ages and to such extent that early humans would perhaps already consider us posthumans. In context, then, the ethic of human dignity implies that of posthuman dignity. Moreover, the morality of the posthuman esthetic derives from human desire. Although too often trivial or oppressive, desire yet extends to the altruistic and rises to the sublime. We overcome ourselves not simply through tighter shirts, deeper pockets or darker glasses; but rather profoundly by realizing compassion and creation before only imagined. No less is the full moral weight of the transhumanist perspective. The Faith Position also implies a pragmatic notion that truth may depend on intention. For example, if we desire a chair and do not find one, we may yet make the chair. Likewise, we may not be as desired, but trust and work could make a difference. Some suggest optimism is not realistic because experience often differs from desire. To the extent we lack power, they're right; but to the extent we have power, optimism certainly is realistic, as we use power to promote desired experience. Also, since we don't know the extent of our power, we should carefully test limits. For example, you may not be the man of her dreams, but chances are better if you ask her out. While trusting in desired experience, we should not ignore the possibility of undesired experience. Complacency may prove as dangerous as hopelessness, and we must avoid both to optimize our power. Consider, for example, the attitude we should take toward global catastrophic risks like nuclear weapons and large asteroids. While some ignore, despair or hope passively, the Faith Position entails support of reasonable mitigation efforts, reflecting trust that we will not go extinct before becoming posthumans. Biologists trace human origins back through billions of years of evolution. A broad confluence of observations indicates that our prehuman ancestors, from simple cells to hominids, generally increased in complexity at an accelerating rate, suggesting that the initial evolution of prehumans was less probable than the subsequent evolution of humans. Yet physicist Enrico Fermi observed that the stars present us with paradox. Our universe appears old and large enough to have produced many planets capable of supporting prehumans, but a great silence leaves no objective evidence for posthumans. If there's plenty of time and space for prehumans, and if subsequent evolution of humans or equivalents is yet more probable, where are the posthumans? Another possibility is that posthumans are improbable because humans and equivalents almost always go extinct before becoming posthumans, perhaps destroying ourselves with super-weapons or environmental exploitation. This would be bad news because it puts the explanation for an absence of posthumans in our own future. Thus, as established by Dr Robin Hanson, the great silence may imply a great filter. In the vastness of time and space, along evolutionary paths to posthumans, something may be filtering innumerable possibilities to mere improbabilities. If prehumans are improbable then the filter would be in our past. Otherwise, the filter is in our future, and we probably will go extinct before becoming posthumans. Yet we need to set our expectations higher. Already the feasibility of greater destructive capacity haunts our imagination. We speculate about particle accelerators that open black holes, self-replicating nanobots that consume the biosphere, as well as the shrinking cost and proliferation of existing weapons of mass destruction. Do we collectively and severally have the good will to refrain? Judging from observations like suicide bombings and genocidal massacres, it appears we'll require greater benevolence to survive a greater gap between our destructive and defensive capacities. As computing power increases, we'll probably continue to run increasingly detailed world simulations. Unabated, increasing detail would eventually obfuscate differences between our world and computed worlds, to the point that "simulation" and "virtual" would be poor descriptors. If posthumans attain such capacity and use it to compute many worlds like those in their past then they probably are not the first or only to do so. Rather, as established by philosopher Nick Bostrom in the Simulation Argument, as posthumans compute more worlds, it becomes more likely that they are themselves in a computed world, among the many actually computed rather than a theoretical non-computed world. The same would be true for us. We conferred with Dr Bostrom to confirm that we can generalize his reasoning, which is valid for any creative process that is feasible and consistent with observation. For example, either posthumans probably don't terraform or cosmoform many worlds like those in their past, or posthumans probably terraformed or cosmoformed our world. By extrapolation, either posthumans probably don't create many worlds like those in their past, or posthumans probably created our world. The only alternative is that we probably will go extinct before becoming posthumans. Historically, and even presently, God arguments typically aim to justify traditional Christian perspectives. Those arguments have a particular context, and that context assumes particular values. From our perspective as Mormons, to limit ourselves to prior tradition when arguing for faith in God is to betray new revelation and admit failure before the task has begun. Some of the values assumed when we limit ourselves to prior tradition are the very dogmatisms from which new revelation would free us. We feel to identify with Paul, the Apostle to the Gentiles, who argued that converts need not first become Jews before becoming Christians. Similarly, we argue that we need not limit justification of our faith to the standards of the prior tradition from which ours emerged. With new revelation comes new context. It is with new context that we seek to justify our faith. Like Paul, we diverge from tradition. We aren't concerned with omnipotent ex-nihilo creators or uncaused causes. In fact, some may say that we are atheistic in this regard. Our argument does not justify faith in the God of traditional Christian perspectives. Rather, the New God Argument justifies faith in God as revealed in Mormon tradition. Joseph Smith proclaimed that God was once as we are now, became exalted, and instituted laws whereby others could learn how to be gods, the same as all gods have done before. Brigham Young reasoned that we must prove ourselves as friends of God to earn the trust required to become Gods. Wilford Woodruff taught that God is progressing in knowledge and power without end, and it is just so with us. Lorenzo Snow prophesied that children now at play making mud worlds will progress in knowledge and power over nature to organize worlds as gods. So we formulated the New God Argument, in part, for a Mormon audience. According to Mormon philosopher Sterling McMurrin, "The primary task of theology is the reconciliation of the revelation to the culture, to make what is taken on faith as the word of God meaningful in the light of accepted science and philosophy." The New God Argument does exactly that, reconciling faith in God as revealed in Mormon tradition with the logical implications of assumptions that are consistent with contemporary science and technological trends. This can inform practical decisions Mormons must make going forward as a religious people, and facilitate Mormons' interaction with an increasingly secular world, perhaps even serving as a proselyting tool. Another audience for whom we formulated the New God Argument is that of secularists who profess atheism, and particularly those with transhumanist inclinations. Although the argument does not compel them to believe in God, assumptions widely shared among them logically imply they should trust in posthumans that may qualify as God, as illustrated by Mormon theology. Accordingly, the argument combines religious titles with secular content to emphasize the parallels, and to exercise the value of theology as application of symbol to substance and creation of meaning. Yet the argument stands on its own, with or without consent to the theological implications. Some will not be inclined to worship the God entailed by this argument. On the one hand, some will feel it's too cold, too distant, smelling too much of UFOs and tasting too much of ET. On the other hand, some will challenge that nothing in this argument compels us to grovel in adoration. With both, we completely agree. An argument for faith in God cannot replace the esthetic of God, experienced in subjective communion. Moreover, no God worthy of worship commands groveling, but rather earns our respect, emulation and friendship. 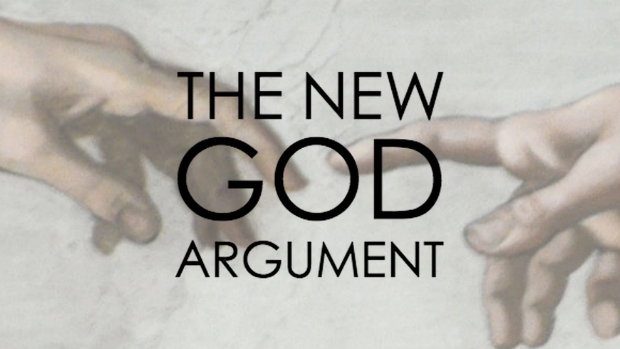 The New God Argument does not contend to provide a relationship with God. It only demonstrates that a common world view, informed of contemporary science and technological trends, leads to and is wholly compatible with faith in a particular kind of God. The New God Argument justifies faith in a natural material God that became God through natural material means, suggesting how we might do the same. As emphasized in the argument, benevolence and creation are among the means and essential to them. This is the God of which we learned from our Mormon heritage, which so fully persuaded us of the practical value of faith in such a God that we would posit this faith even if God didn't exist yet. However, the New God Argument proves the improbability of becoming like God unless God already exists, and so reinforces our obligation to faith. "Eternal progression" is what Mormons call that perhaps unfamiliar version of Darwinian evolution. "God" is what Mormons call those god-like extraterrestrials that didn't start that way. Whether we ever get to know them or not, there are very probably gods. So says Richard Dawkins. So said Joseph Smith. So concludes the New God Argument.